What makes someone a legend? Some say being one of the best in your field. Others might say it comes after many years of doing that thing you do so many times. Still others think it is when that one name keeps rising to the top of others listed in one category. Such is my definition of why I think Kozmo has reached that status along with only a handful of street performers. 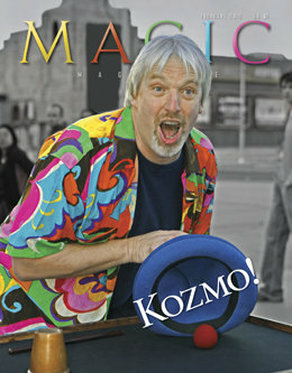 One of the "cover boys" of MAGIC Magazine, Theodore "Ted" Brainard (aka "Kozmo") has built a reputation as a street magician after decades of experience and over 30,000 shows. He has made a comfortable living from the street having performed around the world and nearly every kink of climate. But as Kozmo is moving away from frequent street performances, his time and attention has been divided between the street and his video production company, "Kozmo Magic". Not only does he direct, produce and market DVD's by some of the top professionals today (like Doc Eason, Garrett Thomas and others), he also produces the bi-monthly digital magazine, Reel Magic. Kozmo talks on the podcast about his mentor, the late Jim Cellini, working the street, how to get crowds, similarities to trade show magic, and Reel Magic. Congratulations to Tim Rappel, winner of this week's contest prize "Cool Cash". Watch for upcoming contests on The Magic Word. For a FREE 48 hour trial of Reel Magic, send an email to KozmoMagic@me.com and Kozmo will turn it on for you. John T. Sheets presents a collection of impromptu bill switches that are perfect for any magician. Included is everything you need, except the bills. On this DVD, John teaches: Cool Cash: Two bills, of different denominations, visibly change places between the magician's hand and the spectator's hand. Tagged with Kozmo, street magic, Cellini, New Orleans. October 20, 2016 by Scott Wells.